This topic contains 19 replies, has 5 voices, and was last updated by Anonymous 9 years, 11 months ago. Completing soon in Calahonda, after all i’ve heard about Telefonica I wont touch them with a barge pole, I don’t really need a fixed line anyway but I must have broadband to keep in touch during my stays in Spain. Hola Steve! Glad you found somewhere to buy finally!! Try Vodafone, you can buy on one of their modems on a pay as you go basis and they have kiosks everywhere. I remember you talking about Vodafhone before, I will look into it. I.ve heard there are companies along the coast doing wireless internet where by they fit a small device on your house and then you only pay for useage. Yes but be a bit careful, a few of them have gone under after charging for the fitment, also the signal strength could be weak. At least with Vodafone they are a large company. As I need immediate access to e-mail and broadband next Monday, going to get a vodaphone stick and buy time, I can decide on a more permanent solution at my leisure. Is it complicated, do you have a CD to install on your lap top, are there instructions in Spanish, is it idiot proof? It is idiot proof – I managed it!!! All you do is plug the modem in, the driver is in the stick (usb point) follow the instructions and put the pin in. Took me 2 minutes, honest! We are having a microwave system fitted by Iberbanda. Not sure if the cover the area that you want, but it is an unlimited 1 meg upload & download system with free installation. A bit pricey I think at €39 pm, but we can’t use a dongle in our area as the signal is pants. This isn’t the Iberbanda website, but one of their agents. It’s worth a look anyway http://www.iberbandainenglish.com/coverage.htm .There is a 2 week lead time for installation, ours is being fitted on the 16th Feb.
Just an update. I had a telephone call at 0830 this morning to my UK home number from Iberbanda. They confirmed an engineer will be around between 12.30- 13.00 on Monday 16th. I like them already 🙂 This sort of communication is needed more often (not just in Spain but at home too!!). The final part of the story is that the internet was installed on Monday, the engineer arrived at 1pm. Installation took about 1 hour and then the engineer set about adding usernames, etc. I then added my PC World purchased wireless router to the little “box” which the aerial terminated in and away we went. Speed tests from Thinkbroadband (I didn’t know any Spanish sites to use) showed that although I am signed up for a 1 MB upload/ download service, I was receiving (wirelessly at the laptop) 0.5MB download and 0.2MB upload. I then plugged a LAN cable into the router a nd the speed roase to 0.8MB down and 0.4MB up. I believe that if I were to plug directly into the Iberbanda box, I would at least receive the 1MB download speed. I don’t know what the contention ratio is of the service, but hops were taking an age. I used the bbc.co.uk website (again as I didn’t know any reliable Spanish sites) and ping times were 300- 400ms in peak and still in the 200s out of peak time. All in all, I wish I had gone down the Telefonica route personally as I would have had sMB for not much more than I am currently paying. That said, it is good enough for Skype. Thanks for the updates, me back in the uk now after 12 days at the new house, I bought a Vodaphone pay as you go do modem for 69e giving me a total download capability of 150mb (I think) with unlimited time to use it. I know my way round a computer but I dont know if 150 mb is good or not, the coverage and speed was great, however it stoped working the night before we came home so I guess it needs a top up now. I didn’t use it much, just checked emails twice a day and a small amount of surfing for local info etc. Will have to look into a more permanent solution again. I think pay as you go is very expensive. Either go for a fixed line and some adsl useage or Vodafone for 39 euros per month give you fast adsl on a modem use anywhere with unlimited useage – nothing more to pay. I have used mine for a few months now and am very happy. Yes, think you are right.Now I know that Vodafone works great in the new house I surpose 39e with no ties is not to terrible. 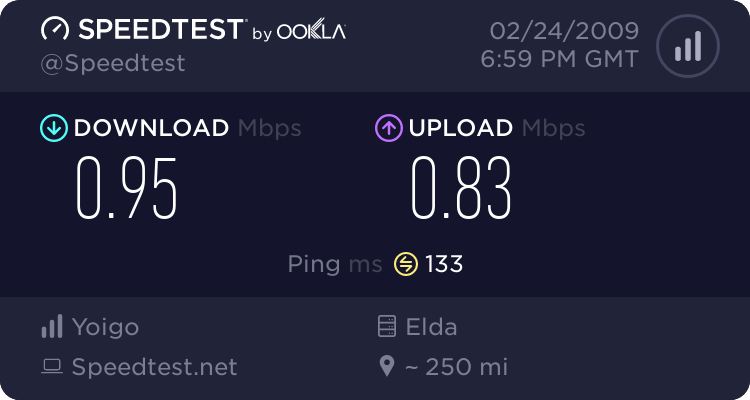 I always use http://www.speedtest.net and using the Elda server for checking speeds. My isp is currently Teletec who I have been with for 4 months now. There are a few downsides being as it’s wireless technology for instance port blocking but overall I am happy with the company and the reliability of the service. I will write up a more detailed report later. Please tell more when you can, not to technical though please, I am very much a plug and play person. Well Telitec is plug and pay and then you play, but the downside is its only available in certain areas and you need to be in sight of a base transmitter but they do a free survey anyway. You place your order, a chap will then come and see if you are able to receive it, if so you pay the man and then the engineer fixes you up with the aerial about 12″ square, lines it up and your good to go. No router to worry about unless you want a wireless system. I have read people are worried about this type of connection being capped, but last month I downloaded 30gigs of television programmes, and this month the same. Support, well I only rang them once left a message and they rang me back so no problems there so far. Because of the technology certain ports are blocked, so things like skype might not be obtainable but that uses a lot of resources anyway with just sitting in your task bar, they offer their own cheap voip service if you need that but I use msn messenger which does me. Also if like me you have a website with cpanel you will only be able to access it in a non secure way, but you can get around that with a proxy that allows ssl. I have my own on one of my sites so I can access my sites cpanel with my own proxy installed there. Occasionally there are dropouts, the storms we had a few weeks back caused a day offline for me but that was a major network problem in Spain. Thanks for the info, I will send them an enquiry and keep you posted. A hard-wired DSL line is best – if you can get it.